When the human kidneys work the way they should, they obviously play a crucial role in keeping the body strong, clean, well-functioning and –fueled properly. Conversely, if the kidneys have infection or failure, it will put the human body at risk, letting waste accumulate and wreak havoc, which explains why it is good idea to do a kidney cleanse regularly. Normally, healthy people will have two kidneys which are about the size of a fist and situated close the waste at either side of spine. Kidneys locate just below the rib cage and have a basic role in assisting the body in detoxifying by removing waste products. Also, kidneys also help control blood pressure, eliminate toxins or drugs, regulate hormones, and maintain strong bones. So, maintaining healthy kidneys is very important if you want your body function well. This article will show you how to get rid of kidney infection at home without drugs. But, before getting to know those remedies, take a look at basics about kidney infection. We cannot deny that kidneys play a great importance in our body. It helps to maintain the acid-base balance, eliminate toxins from our body, produce urine as well as filter the blood. Kidney infection is also called as pyelonephritis under its medical term. Kidney infection is the problem which is caused by bacteria. The bacteria goes from urinary tract, bladder and finally arrives at urethra towards to the kidneys. Either one or both of the kidneys are affected  . The root agent causing kidney infection is bacteria. Bacteria penetrate the urinary tract and goes to the tube carrying urine. They finally find their destination at the kidneys and increase their population resulting in renal infections . Or in some cases, bacteria originate from other parts of the body, then comes to the kidneys due to going along with the bloodstream. As a result, urinary infection happens. Studies have shown that pregnant women are more vulnerable to kidney infection rather than men. In addition, there are some main factors bringing you more risks to kidney infections, such as destroying at the urinary tract, poor immune system, diabetes, kidney stones. Here are some common symptoms of kidney infection that you need to notice. Increasing pain in your back or abdomen. Fever associated with chills and sweating at night. Hematuria- there is blood appearing in the urine. Symptoms of being swollen of your legs, hands, eyes and ankles. Frequently feeling of metallic smell in your mouth. Here are some common symptoms that you can have if you suffer from kidney infection. Increasing in fluid in your daily diet is considered as one of the most effective and easiest home remedies for kidney infection. The more fluid you take in your body, the more bacteria, toxic and waste your body can filter, helping your kidney healthy and clean. The fluids you can drink every day include fresh water, coconut water, lemon water, or juice from vegetables and fruits. So, drinking water as much as you can is recommended for this remedy. The amount of water required every day is 25-50% of your body weight. Normally, you should drink 8 to 10 glasses of water daily. Drink 1 to 2 lemon juice every daily. Take 4 tablespoons of lemon juice and the equivalent amount of olive oil. Squeeze fresh vegetables or fruits to get juice. Drink the juice for providing your body with more minerals and vitamins. Note: Alcoholic beverages, coffee as well as caffeine-containing liquid should be avoided because these kinds of drinks can lead the kidney infection to more serious. When you get kidney infection, you will feel the pain in your back, hips and lower abdomen at first. So to combat kidney infection, you can use hot water to compress on the painful areas. This is also one of the most effective home remedies for kidney infection. 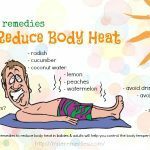 Use a thick cloth or towel to soak it in warm water to compress on your back, hips and lower abdomen for a few minutes. Repeat the method many times until you feel less painful in your back, hips and lower abdomen. 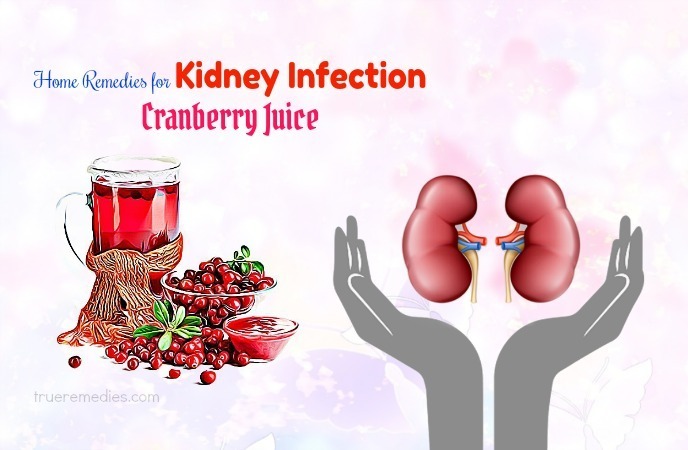 Cranberry juice is another one of the wonderful home remedies for kidney infection. It greatly contributes to healing the damage of the urinary tract. Cranberry juice helps to increase acid level in the urine, helping to limit the population of bacteria in the bladder’s wall. Just drink a glass of cranberry juice without sugar every day. Note: Don’t drink a large amount of cranberry juice (more than 1 liter) every day for a long time. If you drink a lot of cranberry juice for a long time, you can increase of the risk of catching kidney stones because it has oxalate- one of the agent constituting stones in the kidneys. Yogurt is very rich in probiotics and antioxidants, which is a good tool to increase immune system as well as resistance for your body. Therefore, it is considered as one of the most effective home remedies for kidney infection. Take 2 to 3 portions of yogurt in every day. Combine apples to yogurt to make your yogurt more delicious and take it in 1 or 2 times daily. Vitamin C plays an important role in strengthening the immune system, helping to treat with infection. It greatly makes acid level at the kidneys increase, which gives a hand to eliminate the bacteria triggering the infection development . Eat 1 or 2 citrus fruits, such as grapefruits, lemons or oranges every day. Add more Vitamin C- rich foods, namely, potatoes, peppers and so on to your daily diet. Supplement Vitamin C every day as prescription done by the doctor. Note: Don’t supplement Vitamin C too much every day because it can cause the increasing risk of kidney stones. Marshmallow is one of the herbs which are commonly used as home remedies for kidney infection. It has effect to enhance urine flow, thereby eliminating toxics and waste products in our body. Put the dried roots of marshmallow in hot water. The recommended dose is a tablespoon of marshmallow every day. Let it steep for 10 minutes and get the liquid. Drink about 2 to 4 cups daily. Take a jar and put marshmallow root in it. Add some water and tightly cover the jar. Put the jar in the fridge overnight. Add a little honey and shake well. Note: This remedy is not recommended for nursing women, pregnant women and the people having diabetes. Parsley juice can remove bacteria and toxins at our kidneys. Using parsley juice is listed as one of the home remedies for kidney infection. Follow the steps listed here to utilize parsley juice to improve your kidney infection. Put dried parsley (or fresh parsley which is crushed) in some water. Let it cool down naturally and get the liquid. Daily drink the liquid 2 times for some consecutive weeks. Prepare a mixture of parsley juice, some water, lemon juice and some drops of honey. Daily drink the mixture 2 times for 2 consecutive weeks. Note: Ask the doctor for some advice when applying this remedy because of parsley’s reactions with some medications. 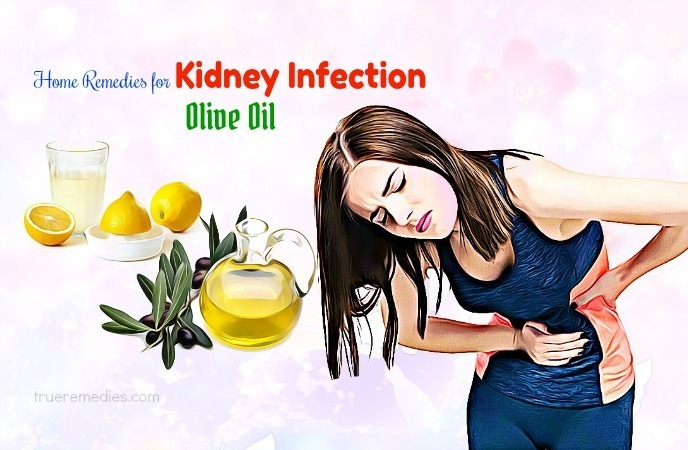 Olive oil is ranked as one of the top home remedies for kidney infection because of its wonderful ability to eliminate toxins in many parts in our body, including the kidneys. Take one tablespoon of olive oil and add some water. Mix a tablespoon of olive oil with 2 or 3 drops of lemon juice. 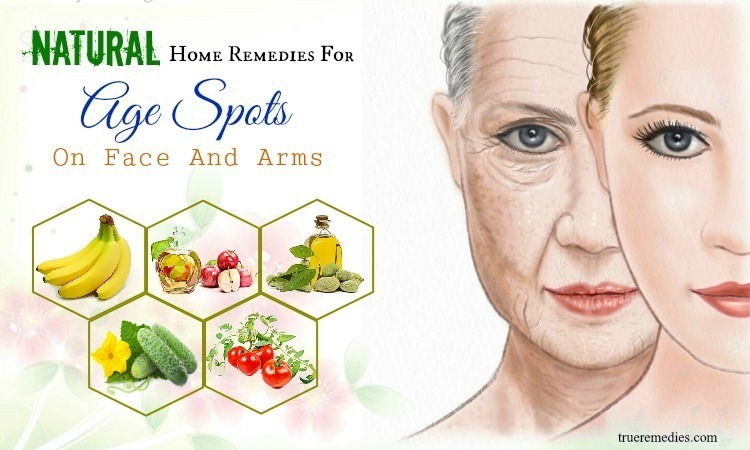 Thanks to antibacterial property of apple cider vinegar, it is very effective to balance pH level in our body and prevent the infection from being spread out. You can utilize apple cider vinegar as one of effective home remedies for kidney infection. Here are the steps you need to follow to use apple cider vinegar to treat kidney infection. Mix one and 2 teaspoons of apple cider vinegar and honey, respectively. Add warm water to the mixture. Drink 2 times every day for some weeks. As you know, garlic is one of kitchen ingredients which have a number of effects for preventing and healing many kinds of diseases. It is not surprisingly that it is one of commonly used home remedies for kidney infection. Eat raw garlic daily before you eat anything in the morning. The recommended dosage is 3 cloves every day. Take some garlic capsules every day on the prescription of the doctor. You may wonder if apples we eat every day can contribute to healing kidney infection. In fact, apples contain abundant fiber and anti-inflammation. It has effect to maintain the acidic level, limiting bacteria’s growth. So, you can try this as one of simple home remedies for kidney infections. Squeeze some apples to get apple juice. Drink the juice every day. Cut some apples into small pieces and put them in a pot. Add some sugar and some water in it and boil it until we get a thick applesauce. Consume some applesauce every day. It is easy to find herbal tea, including marshmallow tea, parsley tea and so on. 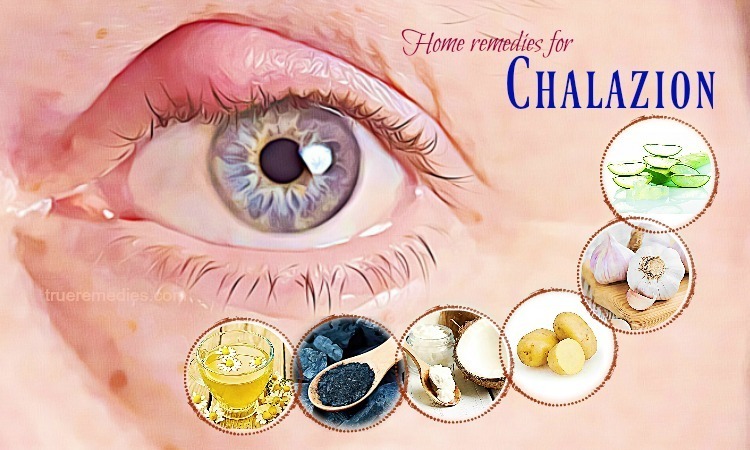 Therefore, it can be considered as one of the simplest home remedies for kidney infection. Drink the herbal tea 2 times every day. Aloe vera is also one of simple and effective home remedies for kidney infection. 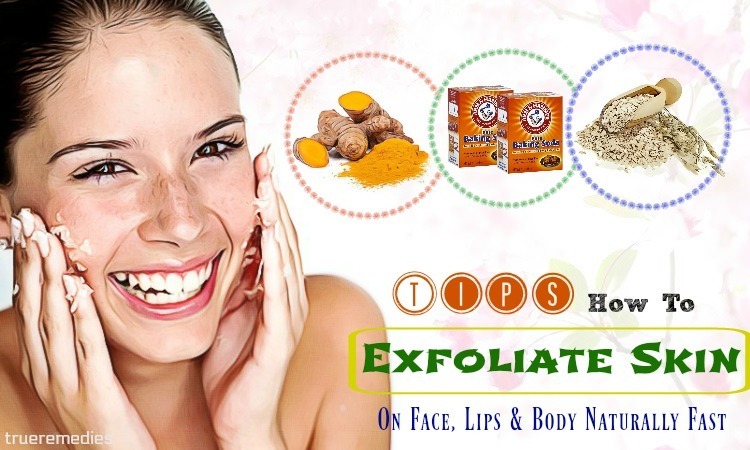 It can help our body to remove toxins. Take some aloe vera leaves and wash them. Mix 2 tablespoons of gel with some water. Drink the juice 2 times every day. Baking soda has wonderful efficiency to balance the levels of bicarbonate at our kidneys. What you should do is very simple. Dissolve baking soda (about one tablespoon) in water. Echinacea has been used for kidney infection for many years. It can help you to not suffer from feeling of pain when you urinate. You can apply the following steps to use Echinacea for the kidney infection. Take leaves, flowers, roots of Echinacea and add some lemon grass and some mint leaves. Put them in a tea pot. Add some hot water and leave it steep in the water for some few minutes. Extract the liquid and add some honey for being more tasteful. Drink a glass of the tea every day. Take Echinacea capsules every day. The recommended dosage is 300mg every day. Note: The people catching multiple sclerosis and tuberculosis should need some advice from the doctor when using Echinacea to treat kidney infection. Basil is a kind of herb that is commonly used in daily diet. As you know, it is very effective to deal with cough diseases, especially in infants and young children. Additionally, it is used as one of the powerful home remedies for kidney infection. It can not only remove kidney stones but also reduce the level of uric acid and strengthen our kidneys . What you have to do is very simple. Take basil juice and add a little honey. Consume the mixture for 4 consecutive months to see the improvement. Celery seed tea has many powers in healing kidney infection. It helps to eliminate waste products and toxics in our kidneys as well as relieve the pains caused by the kidney infection. 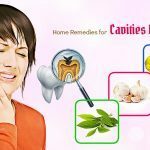 So, celery seed tea is among natural home treatments that you can use to treat kidney infection . Grind an amount of celery seeds (about a tablespoon). Put it in a bowl and add hot water. Stir it well and leave it cool down. Get the liquid and drink the liquid once every day and 3 days every week. Note: Pregnant women are not recommended to apply this remedy. Corn silk is judged as effective in strengthening urinary tract and removing toxins and bacteria. 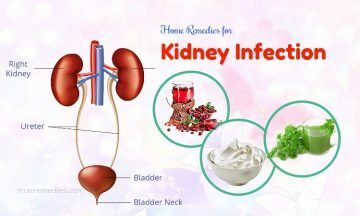 So, it is also one of the natural home remedies for kidney infection that you can apply to help your kidney infection improve. Put corn silk in a pot. Add some water in it and boil it. Leave it steep for some few minutes. Get the liquid and drink the liquid every day. The recommended dosage is 2 to 4 cups every day. The effect of watermelon seeds on the kidney infection will make you so surprised. You should apply watermelon seeds to treat your kidney infection thanks to its enormous power to relieve the pains resulted by kidney infection . Put watermelon seeds in hot water. Leave it steep for a few minutes. Leave it cool down and get the liquid. Cabbage is a kind of vegetable containing a lot of nutritious values. Additionally, it is used to save you from the felling of pain caused by kidney infection. 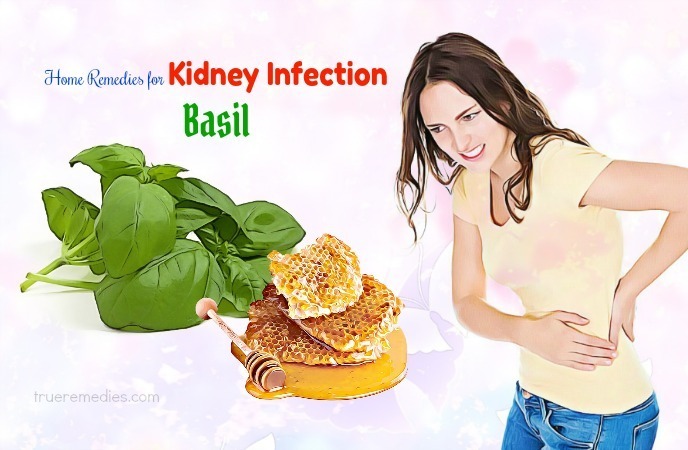 It is very easy to find it, so it is one of the simplest home remedies for kidney infection. The thing you have to do is very easy. Take some onions and chop them into small slices. Put chopped onions, cabbage leaves and some water in a pot. 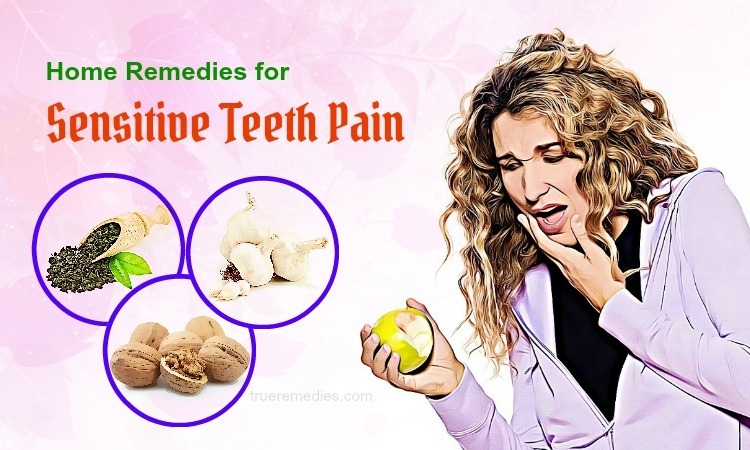 Use the mixture to apply to the areas where you feel painful. Leave it for some hours. You can also use dandelion tea as one of the home remedies for kidney infection to combat your kidney infection. Put dandelion leaves in a bowl and add some hot water in it. Leave it steep for 10 minutes and get the liquid. Consume the liquid every day (about 2 or 3 cups). As we all know, plantain has its power to avoid the kidney infection, relieve the painful symptoms thanks to its combat to bacteria and inflammation. So, if you use plantain as one of the natural home remedies for kidney infection, here is what you should follow. Put plantain seeds (roots and leaves are optional) in a bowl. Add hot water and tightly cover it. Add a little honey and stir well. Consume the liquid every day (about 4 or 5 times). 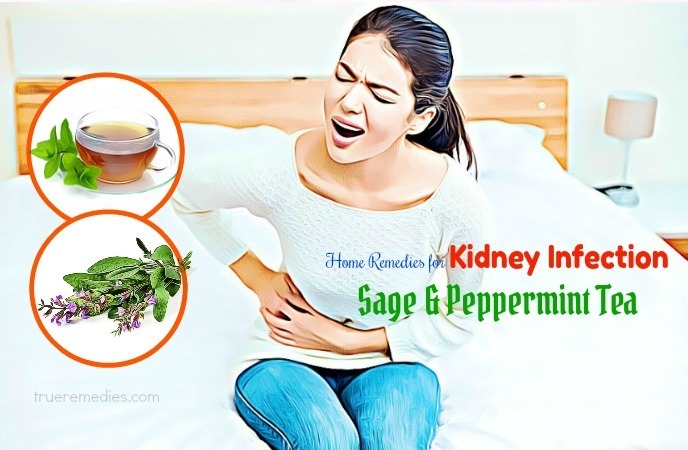 You can use the mixture of sage and peppermint tea as one of the home remedies for kidney infection. Here is the steps you need to follow. Put sage and peppermint leaves in a tea pot. Add some hot water and tightly cover. Get the liquid and consume 2 to 3 times every day. Drink it for 3 consecutive months for getting better results. Uva Ursi is also known as bearberry which is commonly used to heal kidney infection. 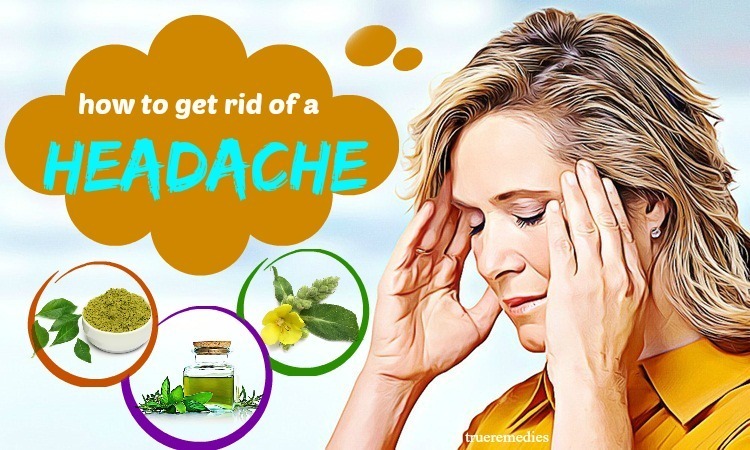 Therefore, you can try it as one of the home remedies for kidney infection. Here is the guiding to apply the remedy. Put some uva ursi leaves in a tea pot. Add some water in it and simmer the pot for 40 minutes. Continue boiling until there is only a half of the water left. Extract the liquid and drink the liquid 2 times every day. The recommended amount is ½ cup. Note: Don’t use this remedy for nursing and pregnant women. Mustard plaster has healing effects which will benefit your kidney infection significantly through reducing pain. You can create a mustard plaster or poultice to harness its benefits. You should do as below. Take mustard powder and add some wheat flour. Blend the mixture to create a paste. Firstly, apply a small amount of paste of Vaseline on the parts which are irritated. Then, apply the mustard paste on the parts which are covered by the Vaseline paste. Note: Wash it immediately if your skin becomes more irritating. The children under 6 years old are not recommended for applying this remedy. 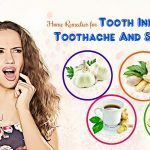 Willow bark has known as one of the home remedies for kidney infection for years, especially in China because it owns a number of properties helping to relieve the pain. It also helps to improve and support our kidneys to work well. 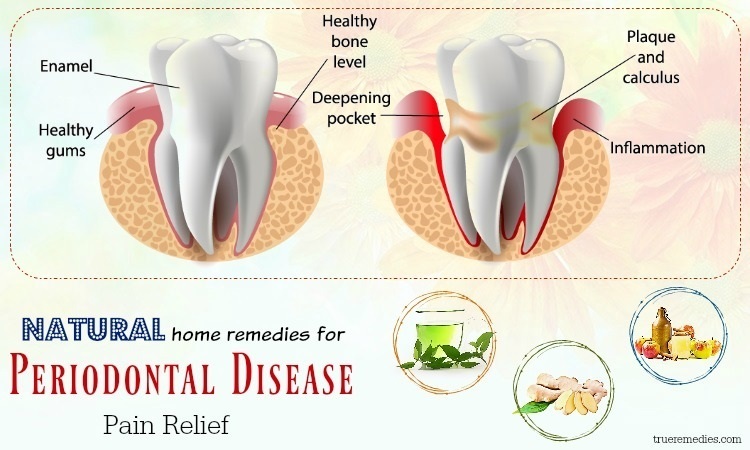 The steps to apply this remedy are very simple as below. Put the willow bark in a pot. Add some water in it. Simmer the pot for 15 minutes. Leave it steep for 45 minutes and extract the liquid. Consume the liquid every day. The recommended dosage is 3 to 4 cups. Take some bark capsules (the bark under the liquid form of 60-240mg is optional) every day. Use tincture 3 times every day. The recommended dosage is 4 – 6 ml. Tomatoes are believed to have its power to treat the pains caused by kidney infection, eliminate kidney stones and other damage in our kidneys. Use a blender to get tomato juice. Consume the juice before eating anything. Consume a cup of water soon after you drink the juice. Take some tomatoes and chop them into small slices. Put them in a cloth and wrap it. Compress on your back to reduce the pain. 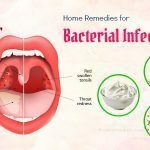 We hope that you have gone through all of our 44 home remedies for kidney infection that you can easily use at home to help yourselves not to suffer from the symptoms of kidney infection any more. 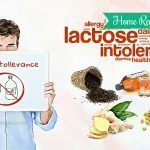 If you have any contributing ideas about our article of “44 home remedies for kidney infection” introduced in Home Remedies Category, feel free to leave your words below this post. We will try to give feedback as soon as possible.